The main difference between oxidative and nonoxidative deamination is that oxidative deamination is coupled with oxidation whereas nonoxidative deamination does not proceed through oxidation. Furthermore, coenzymes involve in oxidative deamination while oxidizing agents do not involve in nonoxidative deamination. Oxidative and nonoxidative deamination are two types of deamination processes responsible for the removal of amine groups from amino acids. Oxidative deamination is a type of deamination reaction that primarily occurs in the liver and the kidney of higher animals. It is a significant biochemical reaction in the amino acid catabolism as it involves in the breakdown of excess proteins from the diet. Also, glutamic acid is the primary form of amino acid that undergoes oxidative deamination. In addition, most of the transamination reactions also give rise to glutamic acid in various types of cells in the body. And, this glutamic acid undergoes oxidative deamination in the liver. Therefore, glutamic acid serves as the collection point of amine groups for oxidative deamination. Furthermore, the enzyme responsible for the oxidative deamination is glutamate dehydrogenase (GDH) found inside mitochondria. Significantly, coenzymes including NAD+ and NADP+ are involved in the oxidation reactions coupled with deamination. Generally, deamination reactions are responsible for the removal of amine groups from amino acids, releasing ammonia and resulting in the corresponding α-keto acids. Here, ammonia is involved in the formation of urea while the α-keto acids can be used to produce energy. Nonoxidative deamination is a type of deamination reaction in which the removal of the amine group occurs without proceeding through an oxidation reaction. However, this type of deamination reactions liberates ammonia, producing the corresponding α-keto acids. Significantly, the hydroxyl amino acids which bear one or more hydroxyl groups undergo nonoxidative deamination. Also, these amino acids are not involved in protein synthesis. Some of these hydroxyl amino acids are serine, homoserine, and threonine. Moreover, the enzymes involved in nonoxidative deamination are the amino acid dehydratases. Also, pyridoxal phosphate serves as the coenzyme for the reaction. However, the nonoxidative deamination of cysteine and homocysteine results in ammonia, hydrogen sulfide, and pyruvate. The enzymes involved in this type of nonoxidative deamination are sulphhydratases. On the other hand, the nonoxidative deamination of histidine results in ammonia and urocanate. Histidase catalyzes this reaction. Oxidative and nonoxidative deamination are two types of deamination reactions occur in the body. They are responsible for the removal of amine groups from amino acids, breaking down the excess proteins from the diet. Also, both types of reactions are enzyme-catalyzed reactions. Besides, both types of reactions liberate ammonia, producing the corresponding α-keto acids. Oxidative deamination refers to a form of deamination which generates α-keto acids and other oxidized products from amine-containing compounds and occurs largely in the liver and kidney while nonoxidative deamination refers to another form of deamination which liberates ammonia without undergoing oxidation. Thus, this is the fundamental difference between oxidative and nonoxidative deamination. While oxidative deamination only occurs in the liver and kidney, nonoxidative deamination occurs in other types of organisms. Moreover, glutamate dehydrogenase is the enzyme responsible for oxidative deamination while amino acid dehydratases are the main type of enzymes responsible for the nonoxidative deamination. Hence, this is another difference between oxidative and nonoxidative deamination. 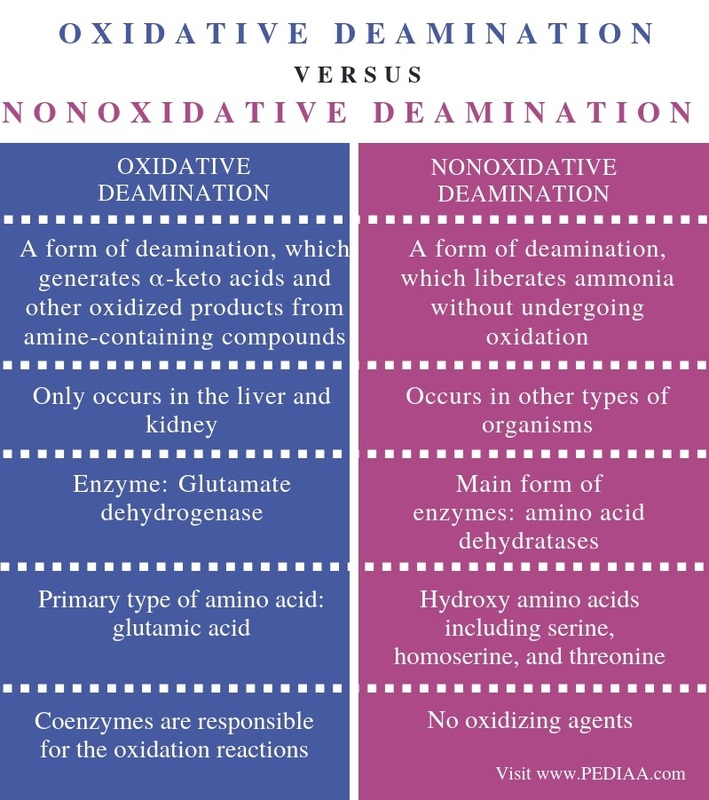 Also, one other difference between oxidative and nonoxidative deamination is that the primary amino acid which undergoes oxidative deamination is glutamic acid while hydroxy amino acids including serine, homoserine, and threonine undergo nonoxidative deamination. Besides all these, oxidation is the main difference between oxidative and nonoxidative deamination. Coenzymes are responsible for the oxidation reactions coupled with oxidative deamination while coenzymes like pyridoxal phosphate are involved in the nonoxidative deamination reactions. Oxidative deamination is the main type of deamination that occurs in the liver and kidney of higher animals. Glutamic acid is the primary amino acid that undergoes oxidative deamination and glutamate dehydrogenase is the enzyme responsible for the reaction. In comparison, nonoxidative deamination is another type of deamination that occurs in hydroxy amino acids. It does not proceed through oxidation. Therefore, the main difference between oxidative and nonoxidative deamination is the presence of oxidation. 1. rohinisane, “Transamination & Deamination.” LinkedIn SlideShare, 19 Nov. 2016, Available Here.